How to flush mount the loudspeaker drivers on the baffle of Temperance? The rim of the bass and midrange drivers are so low (approx. 2 mm) that mounting them flush won't be necessary. But by all means, if you like woodworking just do it. How to mount drivers countersunk? - for other shapes a stencil has to be built; especially for the oval midrange and bass drivers by Newtronics, building a shaping stencil is helpful. In any case, first the groove has to be cut, only afterwards the hole for the driver is cut-out. The picture on the right shows the individual steps from top to bottom. If no router is available, the baffle can be assembled using two boards. The lower, thicker board holds the driver. The second board, glued on top of the bottom one, makes sure that the drivers eventually are flush with the surface. The procedure: the driver should be placed facedown on the top board. Using a pencil, draw the outline of the driver. The use a jigsaw to cut-out the outline of the driver, making sure that the pencil line is not touched. Finally, when all drivers fit perfectly, the top board is glued to the bottom board that holds the drivers. Since the rims of the drivers vary in height (the tweeter is much higher than the others), the baffle could be assembled using different gauge panels or a top panel with the maximum required thickness. To ensure that the four midrange / bass drivers are flush with the front you should put sealing tape under them. Since bass and midrange drivers don't need to be mounted countersunk, it make sense to flush mount only the tweeter. For the tweeter the twin-board method could be used, for the bass drivers this won't be necessary. The tweeter's rim is 5 mm high resulting in a tweeter section that also protrudes by 5 mm. The solution is to use a board for the bass driver section that is exactly the thickness of both boards of the tweeter section. You don't have to keep to the overall baffle thickness (38 mm according to drawing). 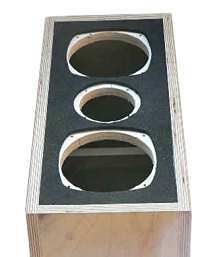 Almost the same sound quality is achieved by using a 25 mm gauge board for the bass driver section and 19 + 5 mm or 19 + 6 mm for the assembled tweeter section. Well, in this case just use cellular rubber instead of the second board. The cutting of the bottom panel is not critical since the driver will eventually cover the hole. The cellular rubber layer is attached to the bottom panel with double-sided adhesive tape. The drivers are placed facedown on the rubber, the outline is drawn or immediately cut with a carpet knife. Finally the rubber covering the driver cut-out is removed. Soft Fibre And Cellular Rubber, using the Stra To loudspeaker as an example.